Few things are as valuable in business, and in life, as the ability to make good decisions. Can you imagine how much more rewarding your life and your business would be if every decision you made were the best it could be? Decision Quality empowers you to make the best possible choice and get more of what you truly want from every decision. Dr. Carl Spetzler is a leader in the field of decision science and has worked with organizations across industries to improve their decision-making capabilities. He and his co-authors, all experienced consultants and educators in this field, show you how to frame a problem or opportunity, create a set of attractive alternatives, identify relevant uncertain information, clarify the values that are important in the decision, apply tools of analysis, and develop buy-in among stakeholders. Their straightforward approach is elegantly simple, yet practical and powerful. It can be applied to all types of decisions. How organizations have benefited from building quality into their decisions. Many people are satisfied with 'good enough' when making important decisions. 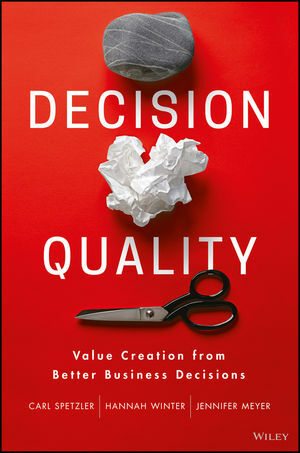 This book provides a method that will take you and your co-workers beyond 'good enough' to true Decision Quality. CARL SPETZLER is the cofounder, chairman, and CEO of Strategic Decisions Group (SDG), a leading strategy consulting firm renowned for its expertise in strategic decision- making for greater value creation. HANNAH WINTER is a partner, strategy consultant, and educator with SDG, where she leads the firm's 10-year education partnership with Stanford in strategic decision making. JENNIFER MEYER leads client engagements at SDG, resulting in hundreds of millions of dollars in added value through better strategic decisions.